Ah the movie that might have been…Sometimes a movie has such potential which is then squandered by bad writing and acting. For instance, Disney’s Brother Bear frustrates me to no end because it had potential and then it makes one bad choice after another. 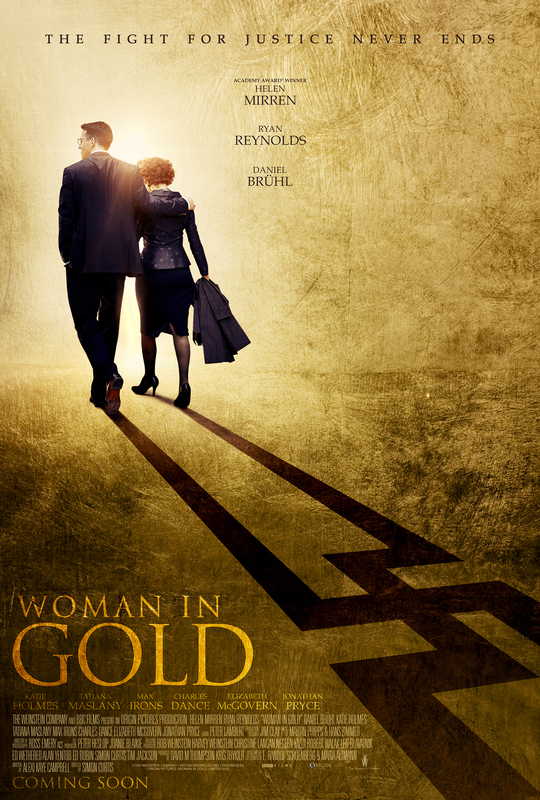 Unfortunately Woman in Gold is another such movie. The true story at its core could have been a good movie but instead we get a tedious poorly acted melodrama. 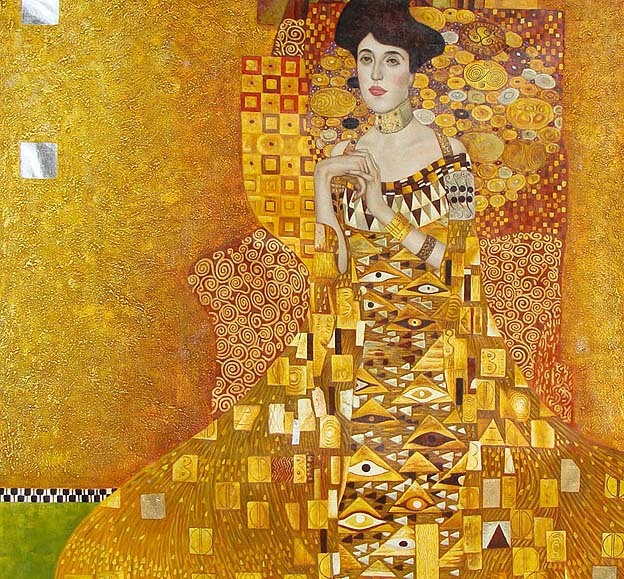 It is the story of Maria Altmann who fought to reclaim the painting of her aunt by Gustav Klimit called Portrait of Adele Bloch-Bauer which was stolen from her family by the Nazis. 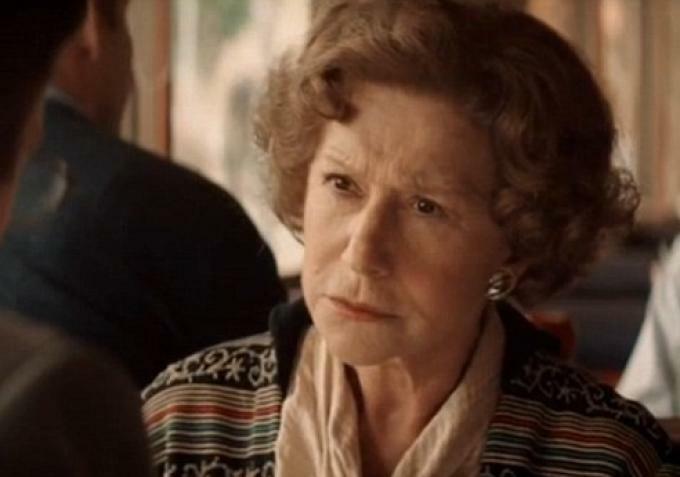 Old Altmann is played by Helen Mirren who does what she can with the bland role and script but we never see any uniqueness to her character, anything that feels authentic or real. Instead she is just a victim we feel sorry for but don’t really get to know . 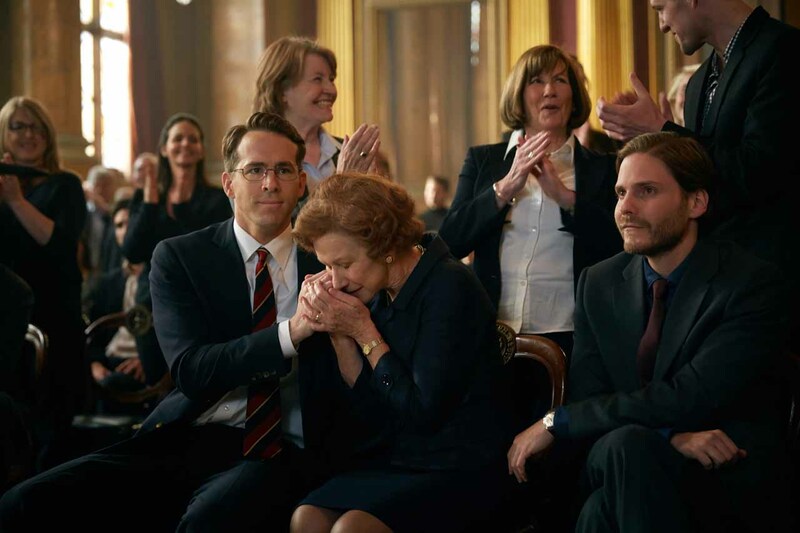 Ryan Reynolds plays her friends son Randy Schoenberg who she hires as her attorney. He has a wife and new baby and a new spot in a firm so taking on a side case with a long shot request is a risk. Again this sounds interesting but Reynolds is really bad. I didn’t buy him for a second in the part and he was completely flat except for when he had to get emotional but even that seemed to come out of the blue. I think a little more of a serious actor like a James McEvoy might have worked better. I kept feeling like Reynolds was going to bust out laughing and instead he just rattles off legalize about the case. He really was bad..
Katie Holmes plays his wife and she’s beautiful but a terrible actress and Tatiana Maslany plays the younger Maria who flees Austria with her husband. The flashback scenes go on way too long and it is all stuff we have seen before and not a lot of tension because we already know that they made it to America. I actually nodded off for a few minutes I was so bored with the bad guys chasing the innocents around Vienna. Then we get some courtroom scenes that I felt I had seen a hundred times and were completely predictable. They even make it to the Supreme Court and hmmm I wonder if she loses and all the effort was for not? A movie with a predictable ending is fine (for goodness sakes I just praised the Longest Ride) but I have to like the characters or the writing is sharp or something for me to latch on to. At least in Longest Ride the couples had chemistry and it wasn’t trying to be all deep and meaningful just a dopey romance. This has airs of an important movie but it fails in nearly every respect. 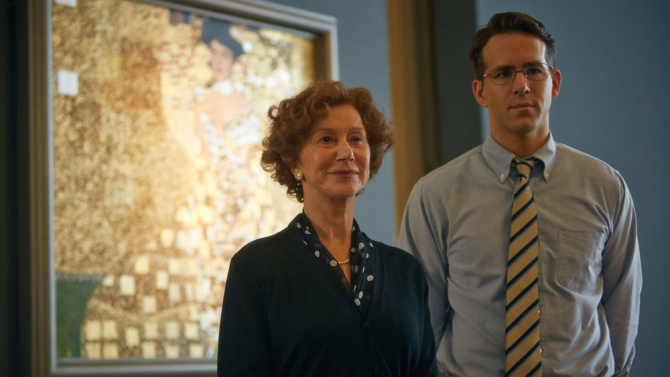 Helen Mirren is good and it is shot adequately but honestly I was bored and I normally don’t use the B word in my reviews. I feel terrible about what happened to Altmann and her family but this movie isn’t the tribute they deserved. In those annoying paragraphs at the end of the movie telling you about the rest of their lives we learn that Altmann gave most of the money to charities and the paintings are on display in New York. That sounds much more interesting than a court procedural squabbling with Austria. Sometimes I also felt that the movie treats the ‘bad guys’ at the Austrian government as if they are on the same level as the actual Nazis shown in the flashback sequences. That’s a little ridiculous. They want to keep a painting not murder 7 million innocent citizens. I’m not saying Maria’s cause isn’t just because it is but the movie could have given some nuance to the Austrians. No real content problems aside from some mean Nazis and 1 f bomb but that’s about it. I feel this movie is just like ‘The Monuments Men’ in what it could have been, from what I’ve heard (I haven’t seen either). It really is a good comparison. Monuments Men is even more of a shame bc it isnt just one good actor but George Clooney, Brad Pitt, Bill Murray, Cate Blanchett etc. Some of the best actors we have right now. I thought about giving it a D+ but its more not good than it is outright bad. I wonder if part of the problem is as great as art is, which it is so important. Hunting down lost art feels like such weak compensation for 7 million lost lives. Plus I think hunting for art is a lot of books and tedium not something all that gripping for a movie. Haven’t watched it, but I do love lady Mirren…. 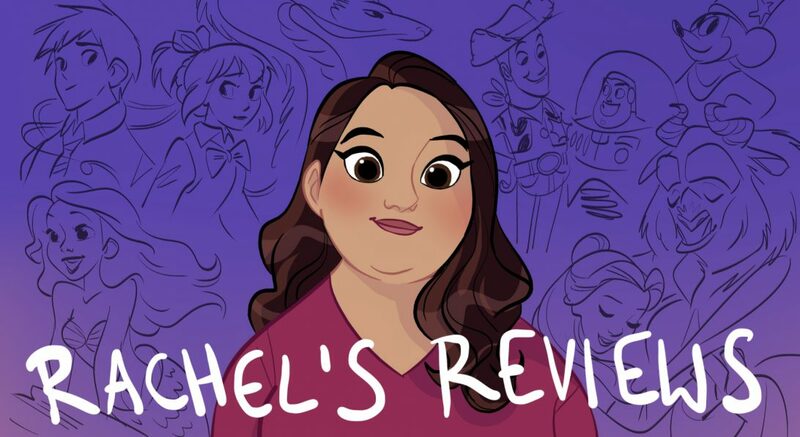 Pingback: Movies I Think are Boring | Reviewing All 54 Disney Animated Films And More! Pingback: Bridge of Spies Review | Reviewing All 54 Disney Animated Films And More! Pingback: Good and Bad of Women in Film in 2015 | Reviewing All 54 Disney Animated Films And More!